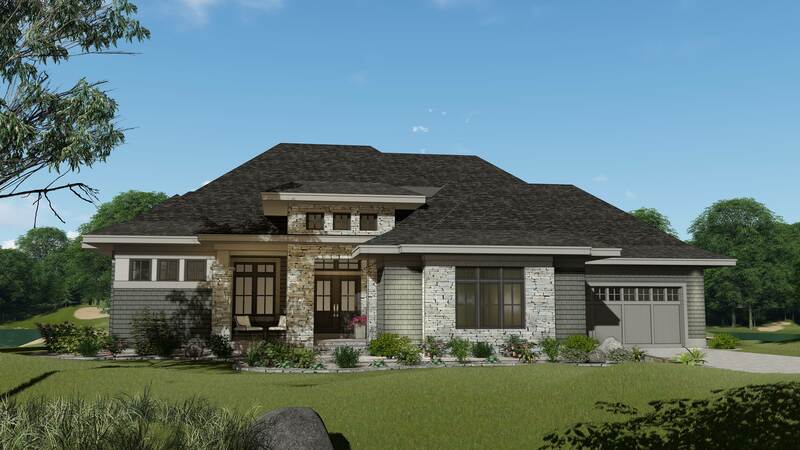 This modern rustic rambler in Lake Elmo touts incredible golf course views, beautiful ponds, and clubhouse access. The home built by Custom One Homes was inspired by mountain lodges of the western U.S. and features big windows, reclaimed beams, and metal railings. The Royal Club, located near the property, is a lifestyle community with a focus on providing residents with a variety of recreational activities. Residents can also enjoy all the conveniences nearby Woodbury has to offer, while only being a short 10-minute drive from historic river towns, Stillwater and Hudson. The bright, open floor plan, designed by architect David Zweber with David Charlez Designs, gives the 4,115-square-foot home an expansive feel, while architectural accents, such as oversized windows, strike the perfect combination of rustic and modern interior trends. And for rustic homeowners longing to feel close to the outdoors, an easy sight line to the 16th, 17th, and 18th holes on the Royal Club Championship Golf Course brings the outdoors in. The two fireplaces in the four-bedroom, four-bathroom home contribute to its coziness, marrying rustic and modern trends together with wood, metal, and stone enhancements. Mid-century furniture perfectly suits this design ethos as well. Lisa Robbins with Design Creatif Group used neutral fabrics, unadorned leather, clean lines, and natural wood to reflect this relaxed, yet sophisticated style. The kitchen includes all the updates of a modern home, including Cambria countertops, designer cabinets, and a high-end Miele appliance package that any accomplished home-chef would appreciate. The house also comes with a golf simulator and a lower-level pub setting, perfect for hosting a virtual golf tournament or an elegant party.